A few weeks ago, I had the pleasure of meeting Peggy and my friend/frequent commenter BATMom at a Dutch market in PA for a little lunch and shopping. Peggy and her husband were traveling through, and it was such a pleasure to meet them both. I purchased some eggplant which I made into an easy and delicious meal, which I'll share with you. 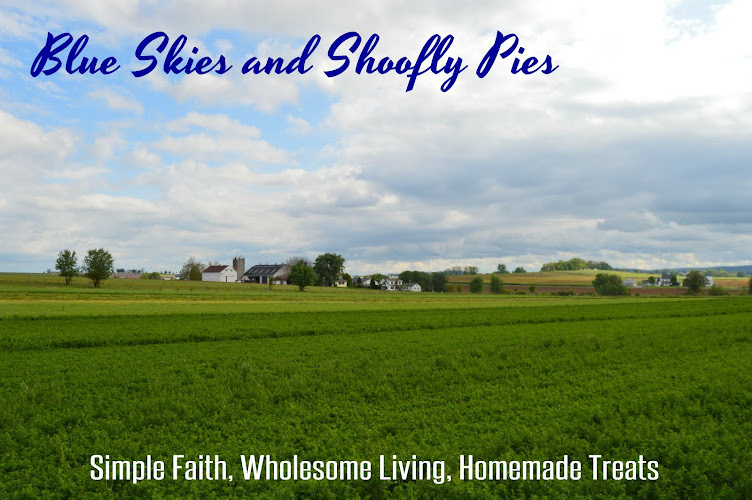 Then I stumbled across this column by Melodie Davis which is about her mother's Mennonite cooking in rural Indiana, and how dinners were really just so-so but the desserts were really something special. It's a critique I've heard about Mennonite, and even Amish cooking for years, that the meals are your basic church potluck dishes but, oh, the baking! I think there is a grain of truth about it, but that things are getting better. Like the writer, I grew up on meals of meat, potatoes, and usually a frozen vegetable unless something was in season. We ate seasonally, but not really. Through the wonders of food preservation, we often ate whatever my mom canned a lot of, and sometimes that meant summer fruit year round. We often did u-picks at local farms and put away such a massive amount of one specific food, that I feel as if I have eaten my lifetime quota of certain things already, and won't eat them anymore. By the time I was 18, I had grown so weary of pork and potato meals that I practically became vegetarian, worn out from the repetition of our predictable suppers. But I don't think we ate much differently than many people in the 1970's/80's did, and unlike Ms. Davis, I did eat broccoli and cauliflower. Things were evolving and our taste and access to food as a nation has continued to broaden. A greater selection of high quality food is available now, and ethnic influences are more prominent in our recipes. Even for people who change slowly, things are slowly changing. There's plenty of good old fashioned Mennonite home cooking that I love, and my dinner table will always have pickles, casseroles, and salads. Maybe there will come a time when dishes other than the pies, sticky buns, layer cakes, and puddings will take home the blue ribbon at the Mennonite Fare. Now that I'm a busy mom, I'm just happy for something delicious that takes ten minutes to prepare before going in the oven. 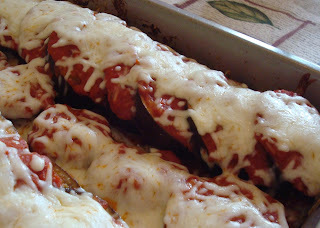 I love Eggplant Parm, but don't have time for breading and frying and baking. I was excited to find an adaptation of this recipe in a magazine put out by a local grocery chain, because not only does it skip the breading and frying, but you don't even peel the eggplant. What a time saver. Spray bottom and sides of 9x13 baking dish with cooking spray; spread bottom of pan with 1 1/2 cups of sauce. Top with overlapping layer of eggplant slices; drizzle with olive oil. Add even layer of bread crumbs; sprinkle with half the grated cheese. Season to taste with seasoned salt and cracked black pepper. Top with remaining sauce and remaining grated cheese. Bake, covered, 40 min or until eggplant is tender. Remove from oven; top with mozzarella cheese. Return to oven, uncovered, 2-3 min, until cheese melts. Let rest 15 minutes before serving. I have never had eggplant. What is it's flavor like? This recipe sounds good so maybe I will try it! It looks delicious, Monica. Never worked with eggplant and I'd have to put aside my thing about a no-meat dish, but I could quite possibly learn to love it with all that cheese! Yes, I saw that column of hers, too, as it runs in The Goshen News. I thought she was probably right about that. Just last night, College Kid whipped up a chocolate cake filled with chocolate chips and topped with chocolate frosting. Which pretty much evaporates like gasoline around here. They do love dessert! That looks so good! I've never had eggplant. Scott doesn't like it so I just never gave it a thought, but I've never seen him eat it since we got married so maybe his taste buds have changed. I'd love to try something new like this. The Mennobrarian's recipes have always been a success around here so maybe we'll give this a try. By the way, I love the sentence, "We ate seasonally, but not really." LOL! @Michelle...Eggplant has a mild flavor almost like squash. This is why, I think, it gets dressed up with breading, tomato sauce, and or combined with other flavors. Oh, I grew up on Mennonite and Old Order Brethren cooking. At our supper table my Momma also always had applesauce, bread of some kind, and potatoes along with the pickles, and meat. I have some old Mennonite cookbooks that are well worn with use!